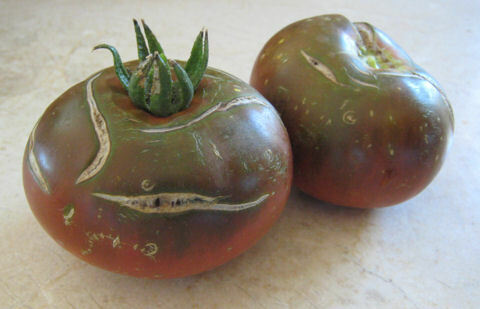 Chocolate Vintage – First Heirloom Tomato This Summer! We’ve had successes and failures (mostly failures) in growing heirloom tomatoes in a cool coastal climate, and on property that was screaming for sunlight. We did manage to cultivate a Brandywine tomato in our cold frame, but somehow the taste was nothing to blog about. Now that we live inland where summer temps climb to the 100’s, our challenge is to keep our veggies from roasting! Just this morning as I was watering the garden, I noticed how two of our very first tomatoes had grown considerably red towards the bottom but were still greenish-brown on top. I thought June 29th was a bit early to pick, but decided to feel the fruit for softness. Good thing I did – it was perfect! This variety is “Chocolate Vintage”, from Love Apple Farm near the Santa Cruz Mtns., CA. As the photo shows, it’s no beauty, there are a few cracks, and today’s picks were at most, 2 1/2 inches in diameter. Yes, this baby is as succulent as it looks! However, the “chocolate-ish” markings are unique. Cut open, the fruit looks undeniably scrumptious. 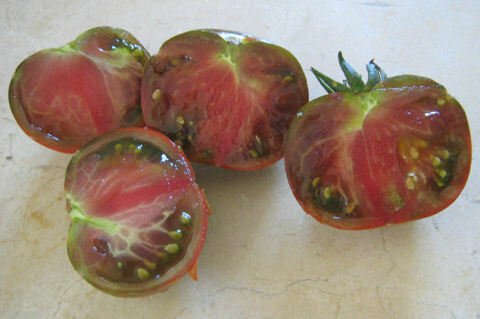 Thinking I’d be biting into a sweet, confection-like tomato, I was taken back by the deep, succulent, brackish flavor! It is not acidic, yet you know this is how a tomato should taste. The saltiness made me inspect my cutting board and knife. No, there was no salt anywhere that could have ‘contaminated’ the taste. But there’s no mistake – this variety seems to have developed its own seasoning right out of the vine! It’s almost the 4th of July and I thought it might be a good time to document how we built our garden boxes at our new place. This was quite an undertaking, but as you can see, our veggies are growing fabulously. We’re especially excited to see the tomatoes and melons really take off. First thing we did was look back at the construction of our last raised beds. Our redwood retaining wall was crumbling from age, so we replaced the redwood with castlewall blocks and extended the same idea to build a raised garden. It did the job, but because layering the blocks makes the area smaller as you go up, you lose some space. Also I definitely wanted narrower beds so we wouldn’t have to climb up the wall and put down a walking plank to get to the middle of the bed. Lastly, castlewall blocks are much more expensive (~3x) and laborious to build than using plain lumber. 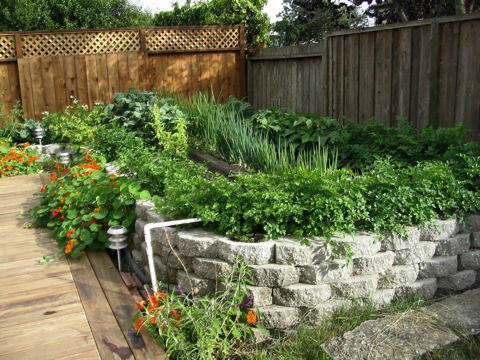 Former raised garden beds built with castlewall blocks - expensive! We also learned from our new neighbors that ground squirrels could be pretty destructive, so we added gopher/chicken wire to our materials list. Top soil/compost mix was also necessary to amend our red clay soil which turns to concrete in the summer. Because we wanted roots to go down deep, we made sure to loosen up and till the clay soil that would be about 18 inches beneath the surface of the amended soil (this was in April so it was still easy to work the ground). In addition, we mixed in fir mulch, our own compost, and fallen, semi-composted oak leaves we found on the property. Living in California means having easy access to redwood which is naturally rot resistant. Another option would be cedar. One should avoid pressure-treated wood anywhere near the garden because it commonly contains CCA (chromated copper arsenate) or other types of chemical pesticides which may seep into the surrounding soil. Interestingly, the redwood planks we bought at Lowe’s were just as expensive, if not cheaper, than pressure-treated lumber. Next we thought about the ideal width for the boxes. We decided on 4ft as this would make it easy to walk around the garden, weed, and harvest veggies. It also meant less wood cutting as we used 8 ft.-long planks. As for the length, we decided to join two 8-ft.-long planks to create 4 x 16 ft beds. There is a slight slope to the garden area. 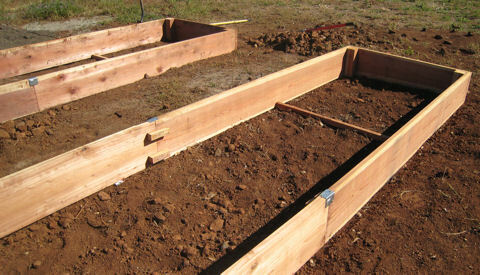 We didn’t level the ground before we started, but we dug down the high side an inch or so before assembling the boxes. First we laid out all the boards approximately where they would go. Then we picked up one end and one side board and squared them up. I suggest that the 8ft boards go on the outside of the 4ft board. That way your garden is exactly 4ft wide on the inside. I fastened the boards with two 2″ screws to make an “L”, then took the next 8 ft plank and attached it to my “L” to create a “U” shape. I followed this same procedure for the other side of the box till I had two 8ft “U”s facing each other. The next step was to level and square up the “U”s. Once we were pretty close to level, we checked the diagonals by measuring the distance across the bed in an “X” pattern. The two measurements will be close if your bed is truly square. If one side’s diagonal is longer than the other, go to one of the corners of the longer diagonal and push on the end of the board. If you are off by an inch, then only move a half an inch and re-measure diagonals. Two "U" sections joined together for garden box. Crossbars keep the boxes square. 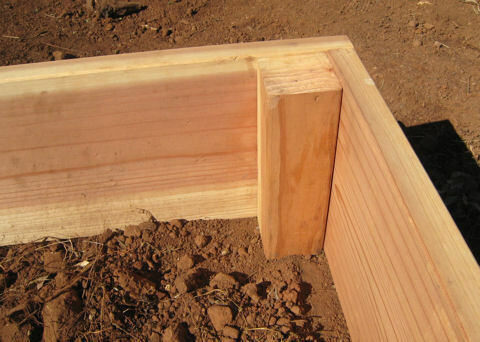 Once the garden beds are level and square, connect the two “U”s together using either straight metal brackets or ~4″ piece of 2×2″ redwood as shown in the picture above. Don’t worry if it doesn’t line up perfectly, but it should be pretty close if your box really is square and level. Now to stiffen the box and keep it square: cut the 4×4″ posts to 11 1/2″ height, insert into each corner, and fasten them with 3 1/2” screws. Then 4ft from each end at the bottom of the bed, fasten the 2x2in 4ft redwood segments. Stiffen box by fastening 4x4 or 2x2 pieces of wood at corners. I had been walking and sitting on the inside of the garden boxes quite a bit, so I turned the soil one last time. It’s really important to keep the soil “fluffy” as roots also need air. From here on out I didn’t step on the garden beds. Toughest part was stapling gopher wire on inside of boxes. Remember not to step inside the box to keep soil fluffy! Roll out the chicken wire and line it up (it’s good to have a helper hold the other end). Don’t cut the wire until you get close to the end, as I found that I needed to cut more than I had initially guessed. After building my first couple of beds I got a good feel for how much extra to leave before cutting. I started by stapling in the middle of the 4ft end and working toward the corners. 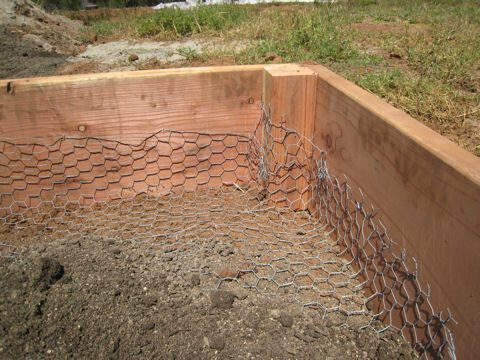 At the corners, I would push the chicken wire in as tight as I could and staple more there than along the length of the beds. Filling garden boxes is the best part of building them. But yes, I was rather exhausted when this picture was taken! Finally – the fun part that the whole family can enjoy! Fill the box with amended soil. 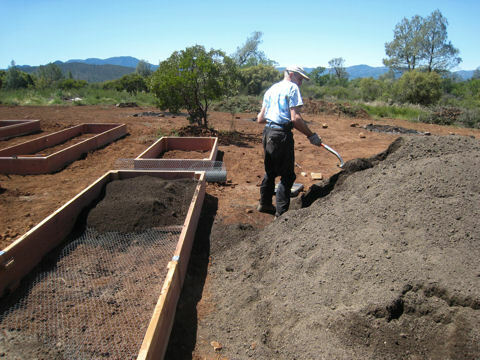 We were able to get seasoned horse manure at the local stables so we mixed some of that in as well. Note that soil will settle once your bed is filled. It is best to water and wait at least one week before planting. 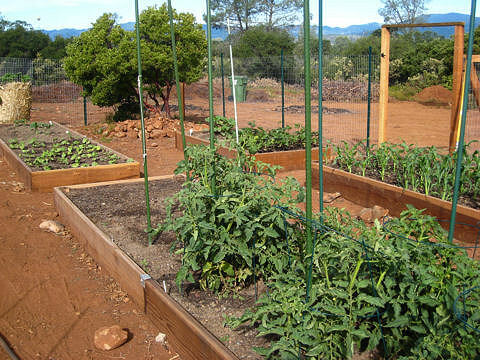 Some vegetables can be stunted if the roots are disturbed as they are germinating. I noticed about an inch of settling in our 12″-high beds. So if you can wait just a little bit longer, it’ll pay off in the end!